The Field Notes Campfire notebooks were inspired by of course the campfire. Each 3 pack comes with 3 different covers, "Dusk", "Night" and "Dawn". Inside is ruled Finch Opaque 60#T paper with a 3/16" graph. Each notebook has been bound with gold color staples. 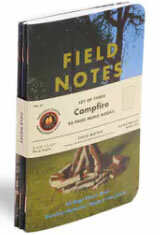 The Field Notes Campfire Memo & Notebooks usually ships within 1 business day unless otherwise specified. Each Field Notes Campfire Memo & Notebooks we sell is guaranteed to be genuine, authentic and will arrive brand new & unused! These field notes have a shiny coating on them, which gives them the campfire logo. It’s fine, I guess, but doesn’t feel the best. The paper is refuse field notes paper, so it’s not the most fountain pen friendly. Does it contain the camfire master's patch? Yes the Field Notes Campfire edition comes with the patch in each 3 pack.